Notice is hereby given an Open House will be held Wednesday, April 24, 2019 from 2:00 p.m. to 4:00 p.m. in the Two Hills County Office for discussion of County Operations and presentation of the 2018 Financial Statement. Audited Financial Statements will also be available. The current fire hazard level is Moderate. 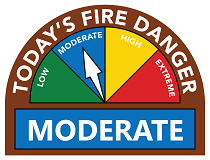 The County of Two Hills will not be issuing burn permits until further notice. With the quick snow melt and cured dry grass that is available, a wildland fire situation may occur. It is recommended that all burn permits that were previously issued be checked to ensure that they are out and will not cause a spring grass fire. Fire permits for large fires like brush piles, bales or old buildings will not be issued. Barbeques, warming fire, fire pits and burn barrels will be allowed but must be supervised to ensure they do not cause a secondary fire. For further information and updates, please refer to this website, our Facebook page or the Alberta Fire Ban website. To be held April 23, 2019 at the Myrnam Elks Hall in Myrnam, AB. For more information, click here.